We’ve already shared an amazing vegan cheesecake recipe here on Hello Veggie, but sometimes making an entire cake feels like too much of a production. 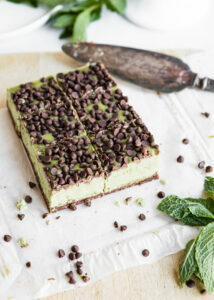 In which case, may I recommend some Mint Matcha Chocolate Chip Cheesecake Bars? The nice thing about cutting your cheesecake into bars is that it makes portioning out individual servings to freeze for later super easy. And let’s be real, who doesn’t need a stash of vegan cheesecake bars in the freezer at all times? I know I do. 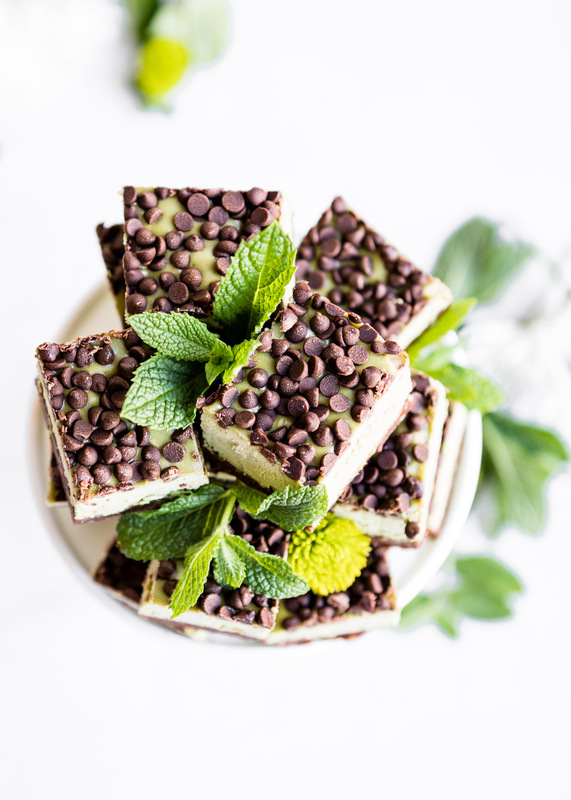 If you’re a fan of mint chocolate chip ice cream (or “chip mint” as my 2-year-old refers to it), this recipe is kind of like that, but in cheesecake form. And instead of being colored with food dye, the green hue is from the addition of matcha. 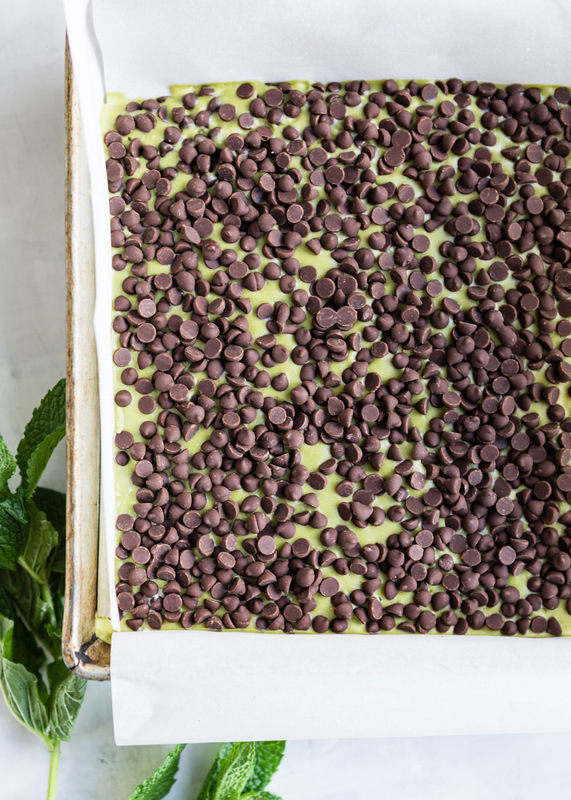 The earthy flavor of matcha powder goes surprisingly well with mint (matcha mojitos, anyone?) and it gives these bars a little boost of antioxidants, but we mostly use it for color here. When buying matcha for cooking, I prefer using culinary matcha, which has a more robust flavor than ceremonial grade matcha at a lower price point, and I always use matcha that’s grown and processed in Japan, as it’s better quality. 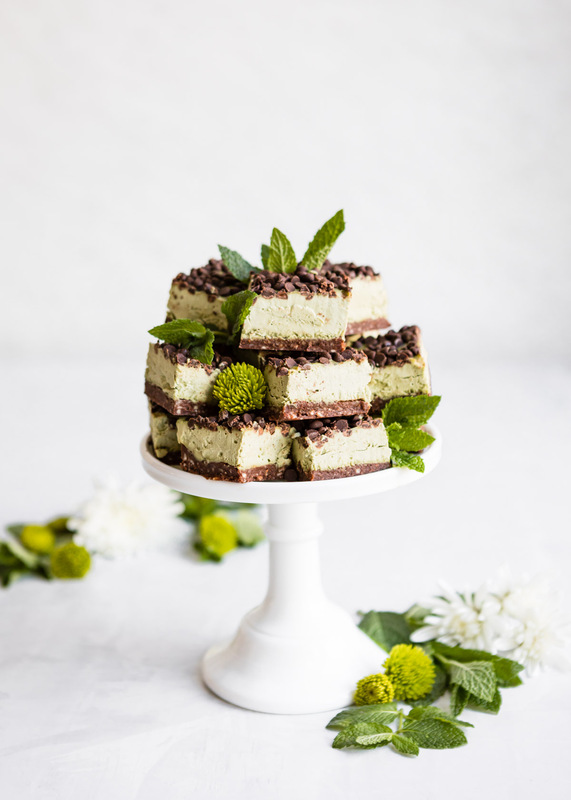 Although these bars are definitely midnight snack material, they’re also great for bringing to a gathering because even though they’re vegan and gluten-free, they’re so delicious everyone will enjoy them. The best kind of recipe! Even though these rich, creamy cheesecake bars are vegan and gluten-free, they're guaranteed to be a hit with everyone. 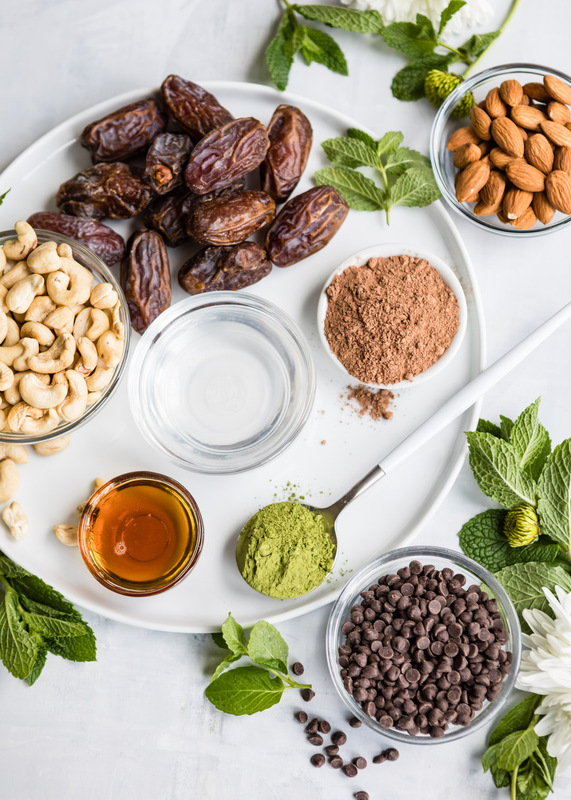 To make the crust: Combine the almonds, dates, and cacao powder in a food processor. Process until the ingredients are finely chopped and take the consistency of a dough. Press the crust mixture into a parchment-lined square baking dish. Pour the cashew mixture onto the crust, spreading it evenly with a spatula. Sprinkle with the mini chocolate chips, gently pressing them into the cashew layer so they stick. Cover the dish with plastic wrap and freeze for about 8 hours, or until frozen solid. Let sit at room temperature for 15-20 minutes before serving; remove the bars from the dish by pulling them out by the parchment lining, then transfer to a cutting board and slice into squares. Leftover bars can be individually wrapped in plastic, placed in a freezer bag, and frozen for up to 2 months.